Who says that New York City is the city that never sleeps? Atlantic Station was alive and well as concert goers filed into Stadium Court in anticipation of their musical pleasure. 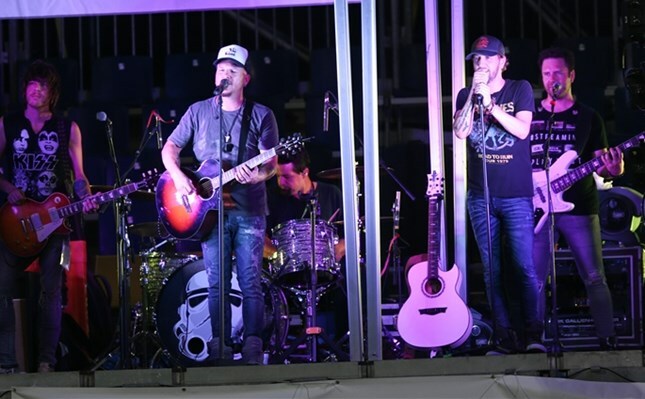 Shortly after play ended on Wednesday, the popular country band, LoCash, performed a late night concert for fans to enjoy. LoCash is a country duo consisted of musicians Chris Lucas and Preston Brust. This group is responsible for hits such as, "Here Comes Summer," "Keep In Mind," and "C.O.U.N.T.R.Y." LoCash is currently in the midst of their "I Love This Life Tour," but took a break just to perform at the BB&T Atlanta Open. The post-match concert is one of many special events the Atlanta tournament hosts, doing whatever it takes to appeal to all demographics of Atlantic Station. Putting on LoCash was no exception. From young children to grown adults, show attendees were dancing to the beat and falling in love with country music all over again. Ball kids proceeded to dance on court as lead singer Chris Lucas announced "I'm going to step on the BB&T Atlanta Court just to see what it feels like." The post-show concert always serves as a melodious medium that marks the middle of the BB&T Atlanta Open. At the end of the concert, fans pack up and go home--all the while knowing tomorrow is another day of fierce tennis. Things will continue to heat up as the second half of the BB&T Atlanta Open goes underway.